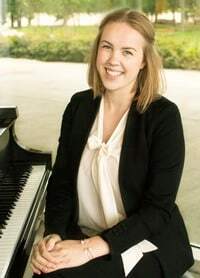 Bethany has been teaching piano for 4 years. Her young energy will be a great match for all students, but especially for beginners just exploring playing music. Music was important in Bethany's home, and she began piano lessons at age 8. She's studied under Dr. Loren and Kozue separately, both highly accomplished, veteran instructors. Bethany comes to All Things Musik well-prepared from observing their proven teaching methods. Bethany knows that learning to play the piano builds life skills beyond the music classroom, such as focus and responsibility. Those skills provide a feeling of accomplishment and confidence that Bethany loves. She's eager to share these with her students. A favorite hobby for Bethany is to use social media to share her love of music. She uploads recordings of herself playing and singing pop music, adapting them for the piano or even learning them by ear, without sheet music. Connecting with music makes her feel calm and relaxed. Bethany knows well what it feels like to be a student, and how to provide a supportive, encouraging environment for each student. She wants students to experience the happiness that a life of piano playing has brought her.